The American songwriter Harold Arlen said it in a mouthful....."You've got to accentuate the positive, eliminate the negative..." Royal Caribbean International, formerly known as Royal Caribbean Cruise Lines, is a true success story in the shark eat shark world of modern day cruise ship operators. It all started with a dream of some experienced Miami shipping men and it came to reality through the hard work and unchanging visions of a second generation. It's hard to imagine when you look at ships like the Monarch of the Seas and consider that her owners are expecting a pair of twins that will come in at some 55,000 TONS MORE THAN THIS 74,000 TON GIANT that it all began with 5000 rust buckets like the 1927 built EVANGELINE and YARMOUTH. Veterans of short haul coastal trades linking Boston and New York with Nova Scotia, these ships ended their careers in the three and four day market along with fellow veteran, the FLORIDA of 1930. These were the ships, with their $54.00 per person minimum fare for the three nighter (and actually, in terms of buying power, a three night Florida to Bahamas cruise is cheaper today!!!) to the Bahamas that began it all...the successful regular cruises from South Florida, which was and is a style of cruising fundamentally, though certainly not totally, different than routine cruises from New York, the west coast, or Europe. The idea of cruising from South Florida quickly began to attract increasing numbers of vacation seekers, happy to begin a cruise in warm weather and relieved to avoid sailing past often ferocious waters off Cape Hatteras. Putting together a consortium of three Norwegian shipping companies, men like Ed Stephan got Royal Caribbean going in 1970, when they took delivery of the first of their new breed, the SONG OF NORWAY. She was followed the next year by the NORDIC PRINCE and their identical sister, SUN VIKING brought up the rear in 1972. Admittedly, the old guard, used to a wide range of public rooms, cabins of various sizes and decor, and European hotel crews, did not quickly take these ships to their bosom, and veteran cruise passengers fond of the stricter formality of another style stayed away. I still don't know anyone who liked their "ravioli sized" cabins. Even though Monarch of the Seas has cabins only slightly larger than ravioli, since the old guard whose favorite ships are longer gone than they are, their opinion of the first trio should not stand in your way of looking at what these new ships are.....an improvement over their predecessors in every way. It is always our intention to provide an individual review for each ship. However, there are not enough differences between this ship and the MAJESTY OF THE SEAS or SOVEREIGN OF THE SEAS to warrant such, and all comments made for them are equally valid for this ship....because Royal Caribbean International wants it that way. They want you to remember the company, but not a specific ship. A cruise and not a unique travel experience. That said, TravelPage readers can understand why our reviews for other new and newish Royal Caribbean ships read so similarly. Not so long ago a ship's uniqueness was best identified by the crew......notwithstanding the occasional eccentric passenger or those who stood out in the crowd, the crew brought their home countries with them....so a Greek crewed ship made you feel as if you were in an Athenian taverna, an Italian ship sent your mind off to enchanting Venice, and a French crew had you humming La Marseillaise. The Monarch of the Seas has a international crew....so there is no pervading atmosphere at all. It's a modern hotel, nothing more, nothing less. So benign is the ambience that most of your fellow passengers will not remember the name of the ship within two years of taking the cruise. Decorative themes in some of the public rooms are but a weak attempt to evoke images of varying cultures or of the "good ole days".....but the results are ertzatz at best.....and are no more evocative than Hollywood movie sets or exhibits one visits at EPCOT. Given the right cabin location, you'll sleep comfortably. If you have a choice, avoid cabins too far forward and too far aft, as they have a tendency to vibrate or waddle in a rough sea. Consider that the Monarch of the Seas is very light in the water, considering her size, and a few large waves or deep swells will have her moving like a pig. Cabins just below or adjacent to public rooms with musical entertainment can be noisy.....and there's no way to turn off the music until the performers are done. The entertainment is Las Vegas style.....and it's probable at least one of the musicians will appeal to you. Much of it is digitally enhanced, on occasion lip synced, and in some lounges just too loud....but it's professionally choreographed, it's pretty to look at, and if you're not in the mood to gamble, shop or watch a movie, it's something to do at least. But for the most part, you won't come away from it thinking "Gee, that was really special....I'll never forget it". The food is banquet quality.....reasonably good ingredients, but prepared en masse and designed to appeal to everyman's taste.....so if excellent food is your priority, try to choose items that sit well on steam tables for hours on end.....the simpler, the better. You can still order anything you desire, and if you don't like what was served the first time around, your server will get you something else. But notwithstanding medical dietary needs, special orders may be more nuisance to you than they're worth. 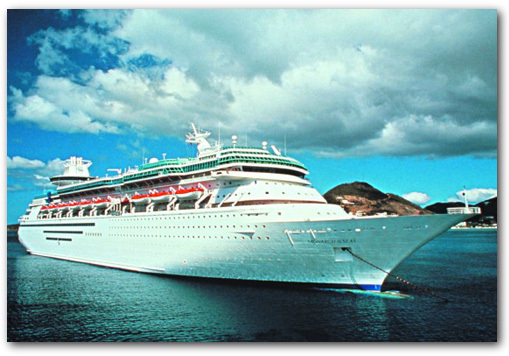 In short, the Monarch of the Seas will provide a comfortable, if not outstanding cruise experience. There are plenty of places to go, but not so many intimate nooks as you'll find on other similar sized ships. The Royal Caribbean "signature" lounge, the Viking Crown, is accessible via elevator, and the views are worth the ride up. It's probably the best place to bask in solitude, at least during a sunny day when fellow passengers are "roasting on the spit" poolside. Nondescript show lounges, nightclubs and bars are located on many of the decks, but all are located aft.....accommodations are placed forward on Monarch of the Seas. Public rooms are neither ugly nor pretty.....but the seats and sofas vary wildly in comfort levels. 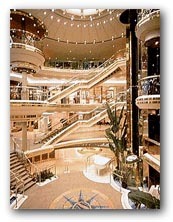 Considered a megaship by her owners, MONARCH has the "required" atrium.....I'm certain anyone who loves to frequent their local shopping mall will feel at home in this space. Anyway, it's not an area I'd be inclined to feel comfortable in during an extremely rough sea. Up on Bridge Deck aft, there's a capable gymnasium and health spa.....prices for services there are creeping upward to an almost obscene level. There's plenty of promenade space, and sufficient....but not wonderful.....amounts of sunning areas. If you are thirsty while outside, not to worry.....Royal Caribbean's trademark of hounding you til you buy a drink is alive and well here. The dinner service was leisurely, personable, and a pleasure. Though not a concern to everyone, the quality of the food has slipped......all of it was edible, but exciting it was not. The sommelier we had deftly navigated us through the wine list. The Windjammer cafe offers a limited but capable breakfast and lunch.... with stand alone circular buffet bars for hot foods, cold foods, salads and desserts, so that lines are minimal. During lunch, there's a choice of five hot entrees with a "roast du jour". .From 6:30pm to 9:30pm, the cafe offers casual dinner dining. There's an outdoor covered area, both port and starboard, with ceiling fans and pleasant varnished wood banquettes and chairs, for al fresco diners. I'm a man who thinks that a great dinner party is one with 50 Benedictine monks who've pledged silence, so I wasn't looking forward to an RCI dining tradition....singing waiters...but I've been foiled again....because on this cruise ship, the singing works, and in fact, it's a welcome vote of good cheer to all....there were no sappy speeches coming from a lounge lizard cruise director, inviting us to drown ourselves in overactive tear ducts for our cruise had come to a close.....there weren't any cues to put our arms around our table companions and pledge eternal friendship....and blessedly, there were no insistent instructions to clap ourselves silly for waiter, busboy, pastry chef.... their parents, grandparents, and so on and so forth. And when the waiters did sing, it never disrupted the service...it was cute, quick and lots of fun. Standard cabins on the ship are very similar to the original railroad pullman look of cabins in the line's first three ships.....they are tiny rooms, with no differences among the seven inside grades and four outside grades other than location. Each has twin beds, with bolsters to make them double as sofas by day, a bathroom with shower, a TV, radio and phone. A larger outside cabin, grade D is available. Grade C is larger still, and has a balcony and tub. Grade B, a grand ocean view suite, has the same fixtures as a grade C, but is a larger cabins and has a sitting area. Category A has two kinds of cabin....one royal family suite and the owner's suite. The family suite has a balcony, a living room area, two bedrooms, one with a queen size bed and the other with twins plus a pullman upper, and two bathrooms. The owner's suite has a balcony, a large living room with four floor to ceiling windows, a refrigerator and bar, a walk in closet, and bathtub. The Royal Suite has a balcony, living room with refrigerator and wet bar, entertainment center and whirlpool tub. As with the public rooms, the cabins are all right.....nothing exciting, but adequate. For our tastes, there are a few too many inside cabins, giving the lower decks on board a dormitory or ferry boat atmosphere. Anyone who wants lots of action, good night life, and doesn't mind living in a shoe box of a cabin....should be pleased with the Monarch of the Seas. I saw all age groups, many nationalities, many income brackets....everyone seemed to have a great time. It's my opinion that whenever a ship carries this many passengers, you're bound to find pleasant company. I do offer this caveat....if your primary concern is formal service, you should consider looking elsewhere....pretension does not go over well on this ship. Monarch of the Seas sails year round to the Bahamas. I know we would have more fun on cruises if we would just toss the cruise line's brochure in the garbage, and set off without preconceived notions. But we cannot.....and as with any major purchase....an kitchen appliance, a car, braces for the kids.....when we're told that item "X" will perform in a certain way, we as consumers, should expect nothing less. So forgive us if we sound cynical....but all cruise lines advertise that they are the best at what they do.....and they would have us believing that they are radically different from all the rest.....but they are not.....dozens and dozens of the newest ships are so similar in design, in decor, in overall flavor....that distinguishing traits are but a blur. One's about as good or bad as the next. The phenomenon of uniformity and loss of character came to the airlines a few short years ago.....much to the savvy traveler's distaste. Now it's happening at a frightening speed to the cruise lines. So as reviewers, about the only thing left for us to consider is whether the Monarch of the Seas is a good deal for what she provides......and what will separate having a good time or not on the Monarch of the Seas will be weather and the attitude of your fellow passengers.....and that we cannot soothsay for you.